Bench Grinders are among the most sturdy and versatile pieces of grinding apparatus available. Because they can be bolted to the floor or mounted on another stable surface, they are incredibly stable compared to hand-held grinders. The grinding wheel can be used to sharpen cutting tools or shape pieces of material (including metal) before they are used in a workpiece. This wheel can also be detached and replaced with a buffing wheel or a wire brush wheel. These wheels can be used to polish completed workpieces or individual pieces of material. 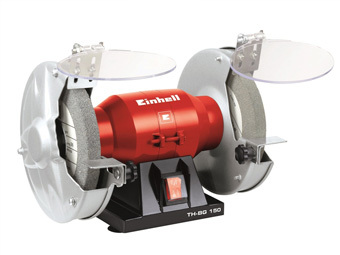 We have a range of bench grinders in different sizes with different maximum wheel speeds. Check out our range to find the one that suits you best.